Juba, July 26, 2018,(AltAfrica) – South Sudan’s government and main rebel group have signed a preliminary power-sharing deal aimed at ending the country’s nearly five-year civil war. However, a coalition of nine opposition parties has refused to sign the document, saying their suggestions for the deal were ignored. The agreement, leaves President Salva Kiir as head of a transitional government while returning rebel chief Riek Machar to his previous position as first vice president. It also calls for creation of a 550-person transitional national legislature and the appointment of another four vice presidents, one of whom will be a woman. 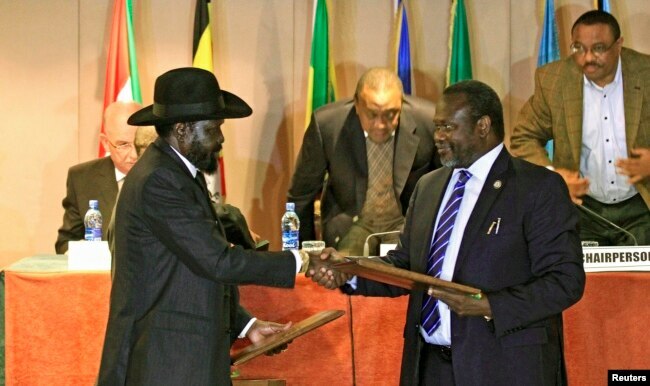 South Sudan’s President Salva Kiir (front L) and South Sudan’s rebel commander Riek Machar exchange documents after signing a cease-fire agreement during the Inter Governmental Authority on Development (IGAD) Summit on the case of South Sudan in Ethiopia, February 1, 2015. The agreement was signed in Sudan’s capital, Khartoum on Wednesday. The government and Machar’s group reached a separate peace deal in 2015 but the agreement collapsed a year later amid a flare-up of deadly violence in the South Sudanese capital, Juba. The East African bloc IGAD mediated the talks leading to the latest agreement. The civil war broke out just two years after South Sudan gained independence from Sudan in 2011. Fighting has led to widespread hunger and prompted nearly 2.5 million South Sudanese to flee the country. Another two million are displaced internally.